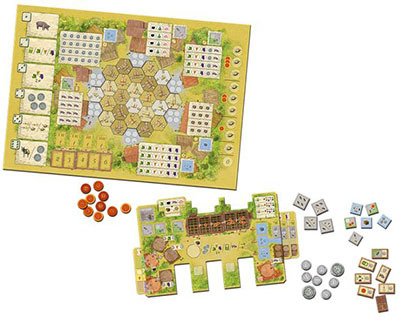 Over the course of six game rounds, players will expand their farm and deliver goods to the village of Esporles, earning them victory points. When a player has fully supplied a craft buil- ding, he receives victory points and a craft marker which grants a bonus for the remain- der of the game. When a player has fully supplied a market barrow on his farm (i.e. the farm cards at the top of his farm), he receives victory points and a trade commodity. It is important to observe the actions of the other players, to manipulate turn order, and to adjust for the vagaries of the dice and the cards during the course of the game. The player who has earned the most victory points by the end of the game is the winner and earns the title of La Granja for their estate! Each player receives a player board (farm), 25 player markers of their color, and one set of donkey markers (four markers containing one, two, three, and four donkey symbols). Each player receives one victory point and 1 silver, placing them next to their farm. Each player also places a player marker on the trade commodity space on their farm. The remainder of the player markers makes up their pool. One player shuffles all 66 farm cards and deals each player four concealed cards. The other cards are placed face down on the table forming the draw deck. Attention: If and when the last card is drawn from the draw deck, all discarded cards are shuffled together to create a new draw deck. One player sorts the roof markers by their game round number and stacks them face down. If there are less than four players, randomly remove roof markers from each stack until the number of roof markers left is equal to the number of players. Place the stacks on the game board in the corresponding space denoted on the board (organized by game round number). The roof markers for round 1 are placed face up above them in the provided spaces. Place the craft markers on the board in the space designated for them near their respective craft buildings on the game board. Place 1 victory point on each of the light gray spaces adjacent to the craft buildings (the ones with the four spaces for player markers). Roll a die. Place building order marker 1 and a victory point on this craft building. Roll the die two more times, placing building order markers 2 and 3 respectively. Place a victory point with each marker. Re-roll as necessary if the building already has a building order marker. Note: Building order numbers should be placed in the center of the symbol rows. Randomly determine the start player. He receives turn order marker 1. In clockwise order from the start player, each player takes the next turn order marker. Return any unused markers to the game box. Select dice depending upon the number of players. The number of dice used is equal to two multi- plied by the number of players plus one. In turn order, each player places one of his player markers on a central market space (with values of 2, 3, 4, and 5) on the game board. The first player places his marker on the market space with a value of 2; the remaining players follow in ascending order. 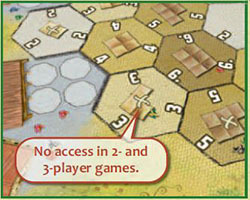 In a 3-player game, spaces 2, 3, 4 are occupied; in a 2-player game spaces 2 and 3 are occupied. In reverse turn order, each player places his siesta disc on the space at the bottom of the siesta track. They should be stacked - the disc of the starting player should be on top. Victory points and silver are placed nearby and form the pool. Attention: In 2- and 3-player games most of the outer market spaces may not be entered. These spaces have an "X" in their center. Attention: La Granja does not contain a game round track. Players may use the backs of the roof markers and the empty roof marker spaces to determine the current game round. 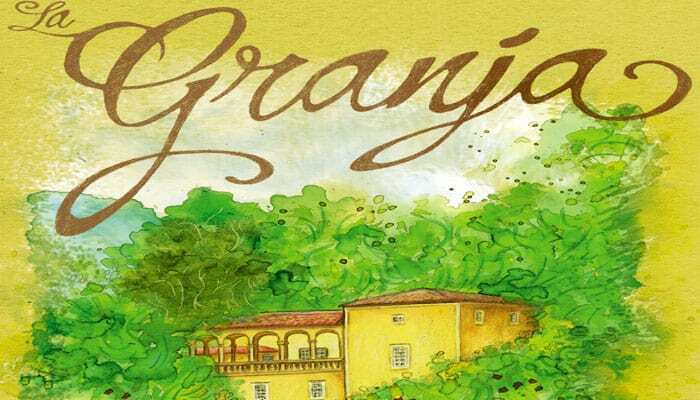 La Granja is a very flexible game - most of the time only the active player may perform various actions in the order of his choosing. This is especially important for certain actions that may be conducted anytime during the game independent of the phase of a game round. These actions include returning trade commodities, buying and selling resources, and upgrading resources. From time to time during the game a player receives trade commodities (most of the time via completed market barrows). Each trade commodity is represented by a player marker on the central space of the farm. The player takes 4 silver from the pool. 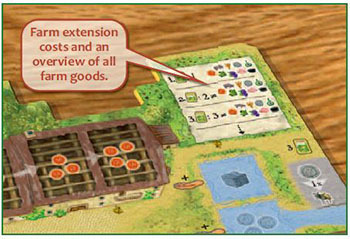 The player takes two different harvest goods and places two of his player markers on the corresponding dens of his farm. The player either tucks one of his cards from his hand under his farm (taking the costs for farm extensions into account, see 6.0) or he draws the top card from the draw deck to his hand. The player takes one pig and places one of his player markers on a pig stall space. The player may upgrade any two of his resources free of charge and transfer them from their dens or fields into the respective dens for upgraded goods. To do so, he moves a marker from a den or field in the direction of the arrow into the corresponding den of the upgraded good. The costs shown on the arrow are not paid. Alternatively, the player may transport trade commodities to one of the craft buildings of the village in the transportation phase. When a player buys resources, he places one player marker per purchased resource in the respective den or stall. When he sells resources, he removes the respective player markers from his dens or stalls. Harvest goods cannot be sold from fields! Exception: Card 35 Agricultural Worker. Attention: Upgraded goods may not be directly bought or sold. A player may buy an upgraded good indirectly by purchasing a resource at its purchase price and then spending silver to upgrade it. A player may upgrade harvest goods and pigs - henceforth they are upgraded goods. To do so, the playermarker is moved from its resource space to its space as upgraded good. The costs for upgrades are listed on the farm bet- ween the dens and fields of the harvest goods and the pig stall and the dens for upgraded goods. The farm phase consists of four steps. One step is always conducted completely by all players before the next step is started. After players are comfortable with the game, the first three steps of the farm phase may be conducted simultaneously. 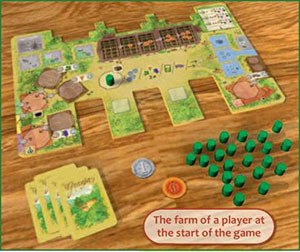 Otherwise, the farm phase is played in game turn order. Each player may play one card and draw one or more new cards at the end of this step. Exception: In the first round all players play two cards! A card placed on the left side of the farm becomes a field. A harvest good will be produced on an empty field - either olives, grain, or grapes (see step 3 of the farm phase). Tuck a card played as a field underneath the left side of the player's farm board so that only the left side of the card is displayed. A player may have any number of fields. A field always enters the game "empty" (i.e. without a harvest good)! A card placed in one of the three slots on the top of the farm becomes a market barrow. Tuck the card underneath the top of the player's farm board so only the information at the top of the card remains visible. Specific goods are displayed by their corresponding symbols. These goods must be delivered to the barrow by the player. When the market barrow has been fully sup- plied, it is sent to the village market and earns the player a trade commodity and victory points according to line 2 below the symbols. A card placed on the right side of the farm be- comes a farm extension. 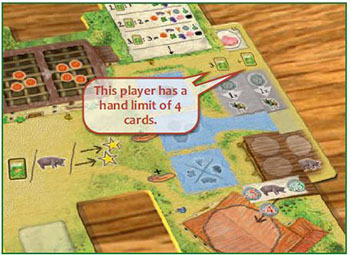 Tuck a card played as a farm extension underneath the right side of the player's farm board so that only the right side of the card is displayed. A farm extension offers various benefits. A card placed in one of the three slots at the bottom of the farm becomes a special helper that gives the player special abilities. Tuck the card underneath the bottom of the player's farm board so only the information at the top of the card remains visible! The helpers and their functions are listed in detail in the glossary. Playing a card as a market barrow, helper, or field is always free. If a player already has three market barrows (or three helpers) on his farm and would like to play another one, he must discard an existing one to make room for the new market barrow (or helper). Playing a card as a farm extension requires the appropriate payment. Farm extensions are paid for with farm goods. Each farm extension card played on the farm costs one more unique farm good than the previous one. The cost of the first farm extension is one farm good, the second is two farm goods, the third is three unique goods, etc. Note: Starting with the second farm extension card, unique farm goods must be used as payment. Players can find an overview of the farm goods and farm extension costs in the top right corner of their farm. At the end of this step, each player draws cards until his hand limit is reached. Each player starts the game with a hand limit of three cards. This is indicated on the player's farm. Each farm extension a player owns and a few helpers increase the hand limit. Attention: The hand limit is only in effect at this time; during the rest of the round a player may have more cards in his hand than his hand limit allows. If a player must discard surplus cards, he may choose which of his cards to discard in order to get back to his hand limit. Each player takes his income from the pool. At the start of the game no player has any regular income. Blue craft markers at a farm (three of them) and farm extensions with a blue part produce income for a player. Income may be silver, harvest goods, pigs, or trade commodities. Each player receives new harvest goods on fields and offspring for his pigs. One harvest good is placed on each empty field of a player. He takes one of his player markers and places it on the field. If a player has at least two pigs, he gets one pig as offspring. Note: To receive this additional pig, a player must have the necessary space in his den(s). If he does not have the space, he does not get offspring (a player may not sell the newborn pig immediately!). Each player may purchase one roof marker from the current round in turn order. Attention: In the first round, players purchase roof makers in reverse turn order! A roof marker depicts its costs in silver. Note: The price corresponds to the current round, starting at 1 silver in round 1 and increasing to 6 silver by the sixth and final round. Purchased roof markers are placed on the leftmost empty roof marker space on the player's farm (this space may not correspond to the current game round!). When a player covers up a roof marker space with victory points printed on it, he immediately receives those victory points. Each roof marker provides a special one-time benefit, which may be used at the player's discretion during one of his turns. All roof markers are colored according to the phase(s) they may be used. After they have been used they are turned face down. Note: Each player may buy one roof marker per round. Since a farm only has five roof marker spaces, a player may buy a maximum of five roof markers. A purchased roof marker may not be discarded. Check here the functions of the roof makers. The start player takes a number of dice according to the number of players (see 4.0), rolls them, and places them to the left of the corresponding revenue spaces. 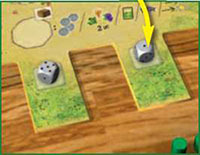 In turn order, each player takes a die and places it on the left die space of his farm and performs the respective action. When each player has done so, each player, in turn order, takes a second die, places it on the right die space of his farm and performs the respective action. One die should be left next to a revenue space. All players now conduct the action of that die in turn order. Check here for the details about the Revenue Spaces. The transportation phase consists of four steps. Step 1 is conducted simultaneously; the remaining steps are conducted in turn order. Each step must be fully completed before the next step is started. Each player secretly chooses one of his available donkey markers and places it face down in front of him. In the first round, the players have all four donkey markers available. In the second round, the previously chosen marker is unavailable; in the third turn the donkey markers selected in turns 1 and 2 are unavailable. At the start of the transportation phase in the fourth round, all donkey markers reset and are returned to the players, allowing them to once again choose from all four donkey markers. Afterwards, game rounds 5 and 6 are handled like rounds 2 and 3. When all players have chosen a donkey marker, all players turn their donkey markers over simultaneously. In turn order, players advance on the siesta track according to their chosen donkey marker (0, 1, 2, or 3 steps). If a player ends on a space occupied by another player, he stacks his disc on top of any disc(s) already there. Note: One of the craft markers increases the number of steps a player moves on the siesta track. A player may not advance beyond the topmost space of the siesta track. The new turn order is determined - the player who has advanced furthest on the siesta track is the new start player and takes turn order marker 1. The player who is second receives turn order marker 2, etc. If two or more players occupy the same space on the track, the player whose disc is on top gets the turn marker with the lower number. The new turn order takes effect immediately. Leave the discs where they are on the siesta track. Players now carry out their deliveries using the new turn order. Each donkey symbol on a donkey marker represents one delivery. The number of donkey symbols on a marker is the maximum number of deliveries a player may carry out. Note: One of the craft markers increases the number of deliveries a player may make. Each player will carry out all of his deliveries before the next player makes his deliveries. A delivery is defined as moving one farm good from a field or den (and sometimes a card) to either a craft building in the village or to a market barrow on the player's farm. A player continues making deliveries until he has used as many of his deliveries as desired. When a player has carried out all his deliveries, he places his donkey marker face down in the top left corner of his farm. This marker is no longer available until the donkey markers reset. Each player may carry out deliveries to all six craft buildings. However, at the start of the game, three of the six buildings are "blocked" and have a marker to denote this. Players may not make deliveries to blocked buildings. Each craft building has a symbol row for each player. Symbol rows are separated by lines. A player chooses an empty row when he carries out his first delivery. He is now assigned to that row. The symbols show which farm goods must be delivered to a craft building. A player may deliver farm goods to various craft buildings in one transportation phase. 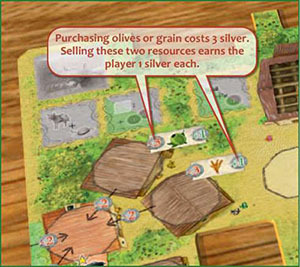 To carry out a delivery, the player takes the farm good in question or the trade commodity from his farm and places one of his player markers on the symbol in "his" row at the craft building. Farm goods may be delivered in any order to a craft building; a player does not have to deliver goods in the order shown in his row. Deliveries to craft buildings may be spread out over as many rounds as necessary. When a player has fully supplied a craft building (i.e. his player markers occupy each space in his row), he immediately transfers one of these markers to one of the spaces at the building highlighted in light-gray. The player may no longer make deliveries to this craft building. His remaining player markers are returned to his pool. If the player is the first one to fully supply a craft building, he immediately takes the victory point from the gray spot. 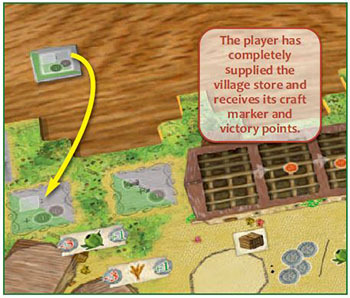 The player also takes one of the craft markers from the building and places it, front side up, on the corresponding space of his farm and receives a number of victory points according to the current game round. Each player keeps his craft markers until the end of the game. The player may immediately use the function of the front side of the marker once! Note: As a reminder, the front side of the markers is somewhat lighter than the back side. Craft markers are flipped to their back side at the end of the current round. Blue: These markers provide increased income. Gray/Green: These markers may be used in the Revenue or Transportation Phase. Gray: These markers provide a bonus function the Transportation Phase. The merchant house provides the player 3 additional silver in step 3 of the farm phase. When the marker is taken, the player immediately takes 3 silver. The wainwright allows the player an additional step on the siesta track in step 2 of the transportation phase and an additional free delivery in step 3 of the transportation phase (but not in step 4 - extra deliveries!). When the marker is taken, the player immediately carries out a free delivery and takes victory points (one time) as determined by the location of his di- sc on the siesta track. The deli earns the player one trade commodity in step 3 of the farm phase. When the marker is taken, the player immediately takes one trade commodity. 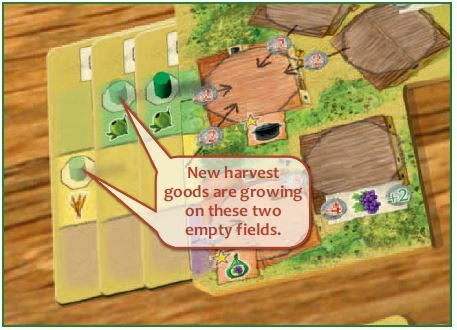 The greengrocer allows the player to take any one resource in step 3 of the farm phase. When the marker is taken, the player immediately takes any one resource. The village store gives the player 2 victory points when he receives a craft marker in future rounds (but not the current ro- und!). When the marker is taken, the player immediately takes 2 victory points. Normally the village store is used in step 4 of the transportation phase - however, it may be used in the revenue phase if a player gets a craft marker after a delivery following the use of a die with number 6. The butcher gives the player 1 additional victory point when he scores a market barrow. When the marker is taken, he immediately takes victory points equal to the number of market barrows at his farm (0 to 3). Normally the butcher is used in step 3 of the transportation phase - however, he may be used in the revenue phase if a player has scored a market barrow after a delivery following the use of a die with number 6. At the start of the game, three craft buildings are "blocked" (i.e. access to them is barred) and occupied by building order markers. These buildings may not receive any deliveries until a player has fully supplied an available craft building. When a player is the first to fully supply an unblocked craft building (and one of his player markers has been moved to the light gray space), building order marker 1 is removed and returned to the game box. This new craft building is immediately available to be supplied by all players (even in the same player turn). The player who triggered this effect takes the victory point from the symbol rows as a reward for unlocking a craft building. Building order marker 2 is removed in similar fashion when a player fully supplies a second craft building; building order marker 3 likewise when a player fully supplies a third craft building. These new buildings are similarly immediately available to be supplied by all players. The player who unlocks building 2 and 3 also receives the victory point from the symbol rows for unlocking the respective craft buildings. A player may supply one or more of his market barrows. The symbols on a market barrow (farm card) determine which farm goods must be delivered to the barrow. The farm goods may be supplied to the market barrows in any order and over multiple game rounds. When making a delivery to a market barrow, the player removes the farm good from his farm and places the player marker on the corresponding symbol on the market barrow. 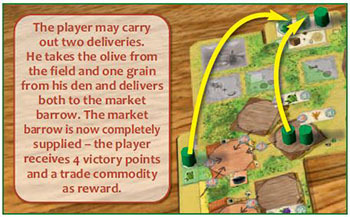 When a player has fully supplied a market barrow (i.e., there is a player marker on each symbol), he takes the number of victory points shown on the card (2 to 6) and moves a player marker from his pool to the central space of his farm, representing a trade commodity. The card is removed from the farm and placed in the discard pile face up. The player markers on the card are returned to the pool. The player may carry out two deliveries. He takes the olive from the field and one grain from his den and delivers both to the market barrow. The market barrow is now completely supplied - the player receives 4 victory points and a trade commodity as reward. The player then takes a player marker from his pool and places it on an empty space of the market space whose number corresponds with the victory point number on the market barrow he just completed. All opponent markers on adjacent market spaces which have a lower val ue are removed and returned to the players' respective pools. The player takes 1 victory point for each marker he removes. Attention: When all market spaces corresponding to the number of the market barrow are already occupied, the player chooses another player's marker on a space that matches the number on the scored market barrow and removes it from the board, replacing it with his own marker. All opponent markers on adjacent spaces which have a lower value are removed and returned as normal, and the player receives 1 victory point for each marker he removes (including the marker he replaced). In turn order, each player may purchase extra deliveries (at a cost of 1 silver per delivery). Players are not required to use any or all of the extra deliveries available to them. Attention:The number of extra deliveries available to a player is equal to the number of extra delivery symbols on the farm tableau (far right) plus the gray rows of farm extensions. Each extra delivery allows the player to carry out one delivery to a craft building or a market barrow. 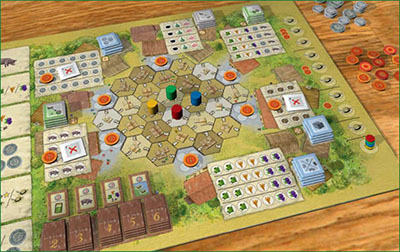 Each player starts the game with 1 extra delivery (as denoted on the upper right of their farm board). Certain farm extensions provide the player with additional extra deliveries. On his turn, a player purchases as many of his extra deliveries as he desires and carries them out. Again, a player does not have to buy all extra deliveries that are available to him! Players return player markers from used helpers to their pool and perform end of round scoring and cle- anup. The last two steps are omitted in the sixth and final round. Each player takes 1 victory point for each of his player markers in the market (players do not take victory points for player markers on craft buildings). Each player receives 0, 1, 2 or 3 victory points as determined by his position on the siesta track. and the other player discs stacked below in turn order. Turn over the roof markers for the next round. Players flip the craft markers they purchased this round to the opposite side, allowing players to benefit from them when appropriate for the remainder of the game. La Granja ends after six rounds. Exchange player markers on the farm according to the normal sales prices (resources) or conversion prices (trade commodities) into silver. Note that upgraded goods cannot be converted into silver. Also note that any harvest goods still in the fields may not be converted into silver - just the harvest goods located in a player's dens. 2. Exchange silver into victory points at a rate of 5:1 (5 silver for 1 victory point). The player with the most victory points is the winner. If there is a tie, the player with the most silver remaining among the tied players is the winner. If there is still a tie, all remaining tied players share the victory.